Silence is golden. And so are my new pillows! - Stop staring and start sewing! Silence is golden. And so are my new pillows! 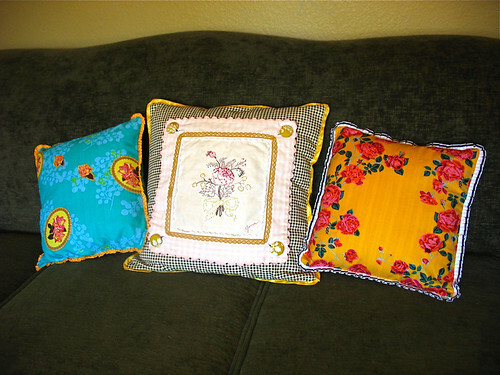 I finally got around to sprucing up my living room a little with some pretty pillow action. My couch is the first thing people see when they walk in the door and it's been a pretty sore sight up until today. Finally something worth looking at! 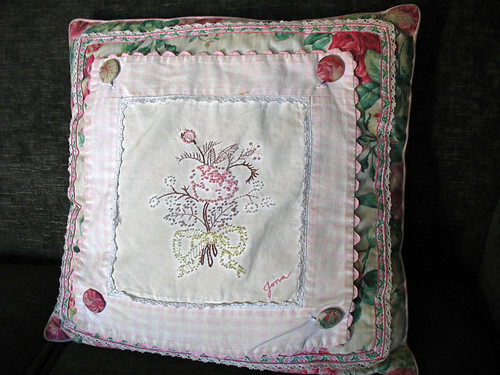 I've been wanting to re-do this old pillow for ages, it's so outdated. 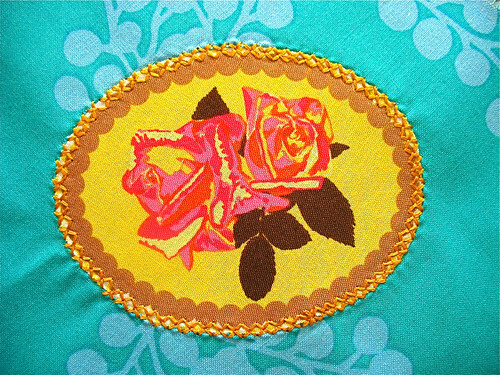 The embroidery design is from a kit I bought about 23 years ago when I decided I wanted to learn how to embroider. It's pretty faded (the brown leaves used to be green!) but I remember how proud I felt when I finished it so I want to hang on to that part of it. I cut the buttons off so I could re-use them. 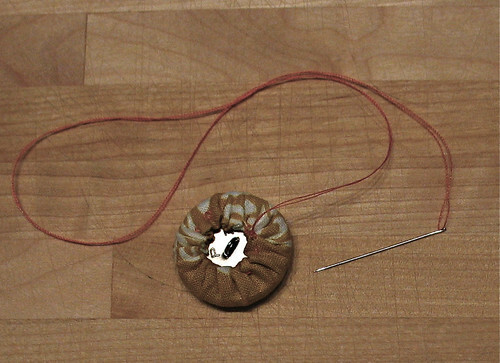 I made some yo-yos and cinched them tight around the old buttons so I didn't have to dig through my stuff for more button covering kits. I added some brighter french knots to the embroidery design just to freshen it up and I added a little bit of gold to it to tie it in with my other new pillows (I couldn't just stop at one!). 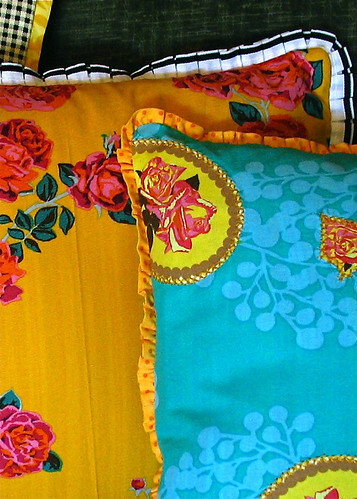 I found these little (14 x 14) pillows at Target for 2.50 and covered them with these gorgeous Garden Party prints. Fun! Now people get to see this when they walk in the door! I'm loving the gold and teal colors together! 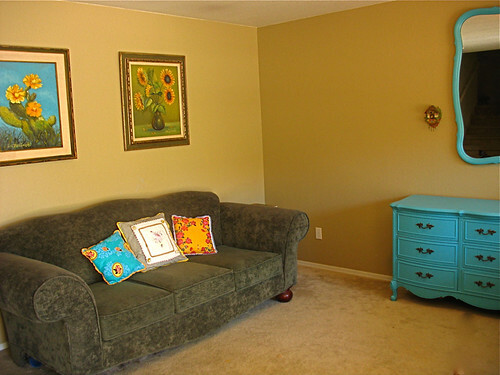 The room still looks a little bland (a new rug maybe?) but it's a far sight better than it was! Yay! In the process I discovered this wonderful criss cross stitch on my machine and it's my new favorite! And...I finally found time to draw a winner from all the August buyers of my Edith Twirl Skirt pattern (I'll probably do it again for you September buyers). Stephanie Secada, C'mon down!!!! 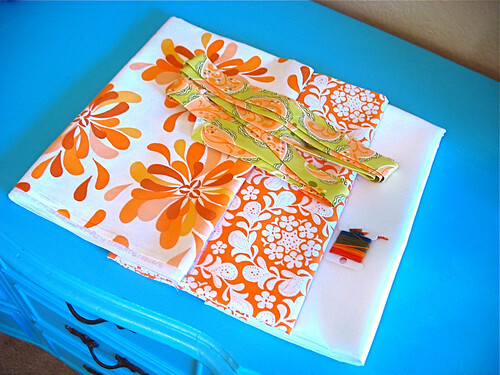 You are now the lucky owner of this sweet skirt kit made from Sandi Henderson's beautiful Farmer's Market fabric! I'll get this out to you right away and add some fabric just in case you want to applique a matching shirt or something. Congratulations Stephanie! I'll have some skirt kits available in my store real soon (I'll even include the embroidery floss!). I'll try to pick some cute combinations! And I'm expecting 10 more bolts of Pop Garden to show up here any second now. Be sure to check out the flickr group I started (and join it!) and take a look at this gorgeous version of my pattern (I love it!). And could this one be any sweeter? Oh, and another one (Yay Kelci!). Have a wonderful weekend!